LAF Technologies is one of Australasia’s leading suppliers of latest generation forensic evidence drying cabinets and other specialist forensic equipment. Our Safekeeper series of general and special purpose drying cabinets complement the range of controlled environment products we offer as a company. Manufactured by world renowned cabinet manufacturer (Air Science) these cabinets are used by law enforcement agencies and forensics specialists throughout Australia and the world. 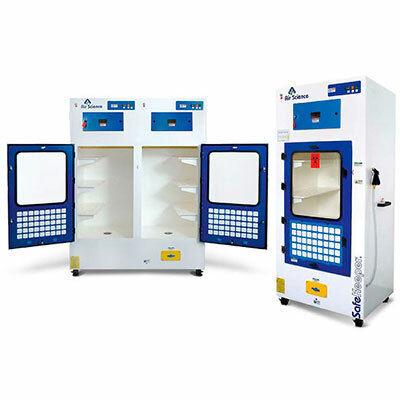 The Safekeeper series of forensic evidence drying cabinets are designed to store, dry or otherwise process forensic evidence in the controlled environment of a tamper resistant compartment to maintain the chain of custody. They incorporate the latest multiplex filtration system and combine this with a stylish, professional design. Their wide range of sought after features offers convenience and protection for personnel during use, maintenance and the decontamination process. General purpose Safekeeper cabinets are available in bench/desktop and floor-standing models. Selected models are available with two, three or four independent drying chambers, each with its own filtration and control system. Most models are designed and configured for mobile use in uncontrolled environments. The Drugkeeper series is designed for safe storage of confiscated hazardous chemicals and illegal drugs. 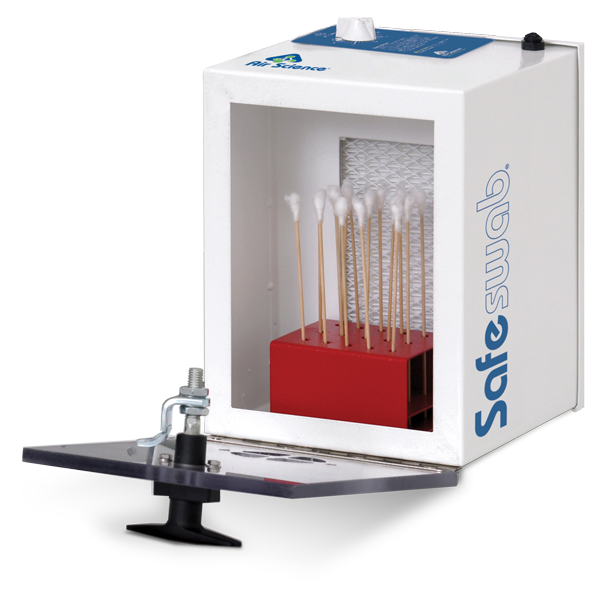 The Safeswab horizontal airflow cabinet is useful for protecting biological evidence collected on swabs from external contaminants, and personnel in the working environment. The Transporter is an “on-site” fabric chamber developed for transporting evidence from the field to the lab. Environmental benefits. Air Science Safekeeper forensic evidence drying cabinets isolate and trap biological and chemical vapors to prevent operator exposure, prevent cross contamination, and eliminate ecological impact through release into the environment. Easy to install. Safekeeper drying cabinets are self contained; venting to the outside is optional. Down flow and standard units are portable and may be moved from one location to another without filter changes and with minimal downtime. Set-up, operation and filter maintenance are straight forward. Safe to use. Cabinet airflow and face velocity protect users from incidental exposures to fumes, odors or blood borne pathogens. Because cross-contamination can occur when drying blood-stained or wet evidence on examination tables, on a floor, in a jail cell, shower stall, closet, evidence room or in the trunk of a patrol car, loss of trace evidence and lack of evidence security can compromise a case. The Air Science Safekeeper series of drying and storage cabinets provide a secure, tamper-resistant area for drying and storing clothing, bed sheets, blankets, towels or other items collected from homicide and sexual assault cases. Safekeeper cabinets are constructed of polypropylene that does not absorb liquids, is easily cleaned with household detergents, and can be sprayed with a 10% bleach solution to eliminate blood borne pathogens and DNA. Cross-contamination between items of evidence dried in Safekeeper cabinets is eliminated. The cabinet floor may be lined with a kraft paper sheet or an optional evidence collection tray to catch trace evidence such as hair or fibres that may fall off the substrate. Optional self-locking evidence security tags provide tamper resistant “locks” to keep contents secure during drying, maintaining and documenting the chain of custody and reducing defence challenges to evidence handling. The Air Science multiplex filtration system prevents cross contamination and fully protects the operator from the hazards associated with the evidence. It also provides the cleanest air available in the industry. 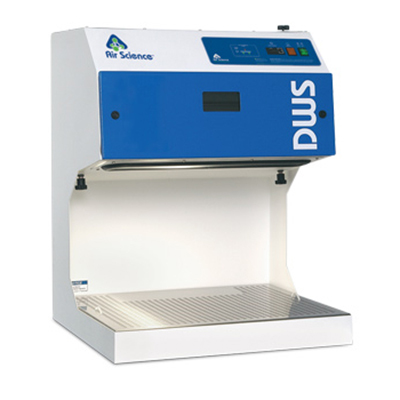 Because there is no ANSI standard for forensic drying cabinets, Air Science Safekeeper products are designed to meet ANSI ductless fume hood specifications. The Air Science carbon filter provides superior efficiency with an optional safety filter to bring the cabinet into full ANSI compliance. 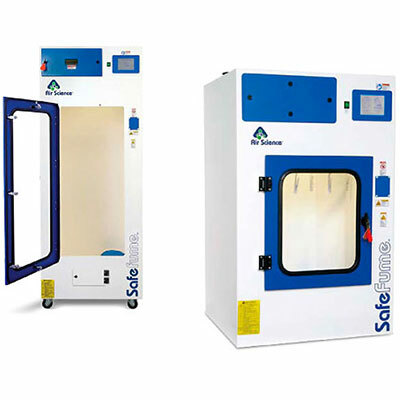 Air Science Safekeeper series general and special purpose drying cabinets, complement the range of controlled environment solutions available from our Australian laboratory and filtration products company. Filter I.D window: When specified, the front cover has a window that reveals the installed filter part number and installation date for convenience and to encourage timely filter replacement. Filter door key: Filter access keys prevent unauthorized removal or accidental exposure to dirty filters. Control panel: Electronic controls and displays include switches for the blower and lights, an electronic hour counter and low airflow alarm, all located on a convenient front surface panel. Hour counter: Assists in tracking evidence drying time. Internal manual speed controller: Authorized personnel may set the centrifugal fan motor speed as desired. Airflow alarm: A continuous air velocity monitoring system alerts the operator upon unacceptable values. Dynamic filtration chamber: The dynamic filter chamber prevents any possible leakage of contaminated air by pressurizing the fan plenum (positive air) and depressurizing the filter compartment (negative air). Outside sidewall hose: Connects to external water supply, located to avoid tripping hazard. Hanging rod: All general purpose and down flow models have a removable stainless steel hanging rod with anti-slide cover. Drain: Central 1.5″ bottom drain with anti-siphon trap and strainer to capture contaminants in waste water stream. Push-Pull shelving: All general purpose models have three perforated polypropylene Push-Pull shelves with drain channel that can be installed and removed with one hand and may be stored within or outside the cabinet; two included with Down flow unit. Color: The cabinet is white with blue doors. Drain valve: Manual open and close drain valve. Electrostatic pre-filter: All pre-filters (doors and main) are changed quickly without tools and are of a standard size for simple stocking and ordering. Optional HEPA filter available. Doors: Blue metal framed tempered glass doors with key lock, tamper proof seal, provide improved security, stability, and ease of cleaning. Built-in containment compartment: Adheres to occupational safety and health administration (OSHA) standards 29 CFR 1910.1030 regarding blood borne pathogens. General Purpose Safekeeper Forensic Evidence Drying Cabinets. 120-180 fpm face velocity (triplex and quad models are 100 fpm). Leveling feet standard on XT models; caster wheels standard on all other general purpose models. Three push-pull shelves per compartment. High strength polypropylene shelves are perforated to permit maximum airflow throughout. Shelves are chemically resistant, easily removable and easy to clean. LAF Technologies offer a wide range of general purpose models and downflow models with a terrific range of features. Outside sidewall hose connection to external water supply, located to avoid tripping hazard. Internal wash down spray hose for decontamination and cleaning. Central 1.5” bottom drain with anti-siphon trap. Strainer to capture contaminants in waste water stream. Optional OSHA Biohazard labeled waste water container for use when drain is not available. Electric waste water pump with foot activated switch to pump to remote drains (not available on Downflow). Optional locking waste water compartment with cover to prevent spillage during transport (standard on Downflow models). Included OSHA Biohazard labeled waste water tank. Optional on-board clean water tank with electric pump. Hose location is exterior, right side, with 8’ hose provided. Hose is configured for standard water faucet connection with female fitting. Standard tap water supply pressure recommended, greater pressures require an optional water regulator. A hard drain and trap is not required. The interior drain is flush with the chamber floor and employs gravity and an integrated powered assist pump. Drain hose routes to standard sink, floor drain or container. Electrical: Line cord provided with standard moulded plug, NEMA 4-14P for quick connection to standard wall outlet, NEMA 5-15R. A separate breaker is recommended. Line cord location is at cabinet top. Exhaust: Ductless filter output cabinet top. Optional 8” collar available with butterfly valve for external ducting. Safekeeper forensic evidence drying cabinets provide cost effective storage and containment for forensic evidence as it is dried by a constant flow of air. Air Science ductless technology removes airborne pathogens, particulates, fumes, and odours emitted by the contents. Elimination of putrid odors and chemical fumes using eco friendly ductless technology carbon filtration. Push-pull shelving, hanging rods and lockable front doors facilitate application of cabinets to many situations. Standard height and downflow models are designed to be moved around a building through standard doorways and elevators. Extra tall units are intended to remain stationary in one room. About multiplex filtration technology multiplex airflow and filtration elements for general purpose series drying cabinets. Electrostatic pre evidence filter with 99.5% efficiency down to 0.5 microns protects evidence from cross contamination by air drawn into the unit. It can be changed without tools. Optional HEPA/ULPA filter available. Additional electrostatic pre-filter (duplicate of the pre-evidence filter) protects and extends the life of main and optional exhaust filters and can be changed without tools while unit is running to prevent operator exposure to captured contaminants. HEPA/ULPA main filter captures biological and other particles larger than 0.3 microns (HEPA) or 0.12 microns (ULPA). Activated carbon main filter, selected for General purpose and downflow forensic evidence drying; filter captures putrid organic odors as well as other fumes that may be present, (e.g., alcohol, solvents, gasoline, etc.). Security key to filter access door. The carbon main filter selected for Drugkeeper models captures specific vapors generated by typical substances found at methamphetamine labs. Filter clamping mechanism allows removal of main filter(s) directly to disposal bag with track and wheel system. Filter gasket evenly seals filter faces to prevent bypass air leakage. Inter-filter test port allows air sampling for manual testing of filter performance. Filter identification window shows the installed filter part number and installation date for convenience and to encourage timely filter replacement. Optional HEPA/ ULPA exhaust filter (complies with ANSI Z9.5 when fitted). High velocity sparkless and brushless centrifugal fan. Dynamic filtration chamber prevents any possible leakage of contaminated air by pressurizing the fan plenum (positive air) and depressurizing the filter compartment (negative air).